Winding down with SOAK Yourself. ESSENTIAL OIL - The oil is made up of a combination of bergamot, sweet orange and lavender essential oils - a divine palette of scents. Now we are nearing winter I'm trying to up my oil game to keep my skin hydrated and the difference of using oils in my bath was huge. What I love about using oils is that you see instant results in your skin after using them. Having oils in your bath is almost like a intensive treatment - your pores are open and so your body can absorb more of the richness and along with the combination of the bath salts and soap your skin feels seriously heavenly. 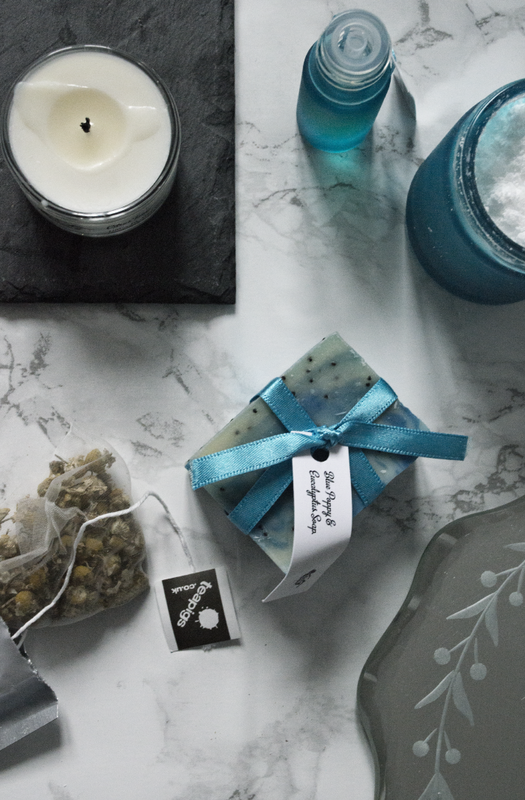 SOAP - I used this while in the bath and found it incredibly nourishing on my skin which was a lovely surprise as I often find that bars of soap can dry the skin out after use. Hand made and fragranced with blue poppy and eucalyptus, this was really gentle on my skin and worked perfectly in combination with the bath salts and oil. BATH SALTS - Remember that episode of Friends where Chandler takes a bath? I had a pretty similar euphoric experience with these foaming bath salts... Bath salts have never interested me in the slightest, they've always been that product sitting at the back of my bathroom cupboard left over from a Christmas box set I'd gotten from Boots one year. But these crystals are worthy of the approval of Walter White himself. CANDLE - Made from 100% plant wax from a natural sustainable source, this candle is the perfect mood setter and with a Citrus Tonic fragrance it can easily rival the edible scents from the likes of Lush cosmetics. TEA - This is probably my favourite touch of the bath box...a camomile tea bag from Teapigs. My ultimate remedy for winding down at the end of the day is camomile tea and so a cup of this after my bath was the perfect ending to the experience! This box was kindly gifted to me, but all opinions are my own. This would make the perfect present (especially for Christmas) and would make an even better gift to yourself for the times when you need uplifting. All ingredients are sourced and made in the UK and are always natural or organic, on top of that, with the sale of each box 50p is donated to charities in need. 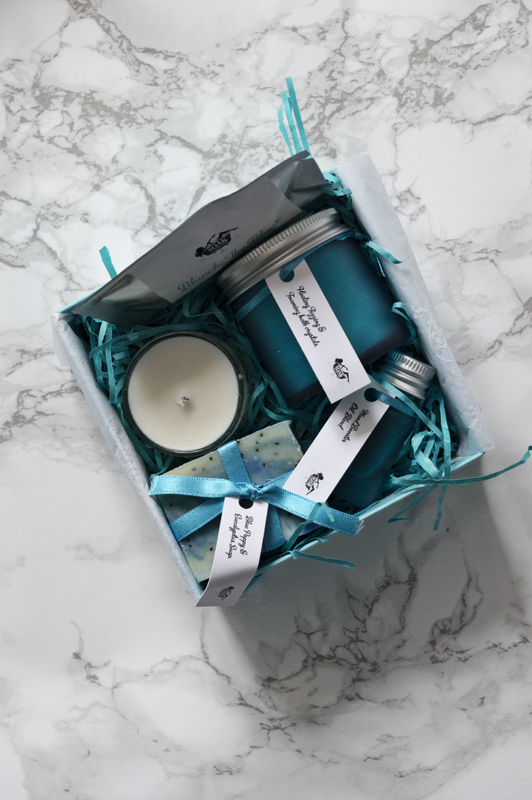 SOAK Yourself is a truly special little company making honest products that really work, so please check out their website linked above or if you live near the Chilterns you can visit their shop, just check out their website for details. As you may already know, a levy has been introduced in effort to reduce the amount of plastic bags in use in supermarkets and retailers - and it's safe to say the news has the public divided. Frankly I think it's ridiculous that it has taken this long for the government to implement this ruling. We are the last country of the UK to start charging 5p for the use of a single carrier bag - of which the proceeds do not go to the government but instead retailers are opting to donate the extra pennies to worth while causes; H&M to UNICEF and Tesco to environmental improvement projects. 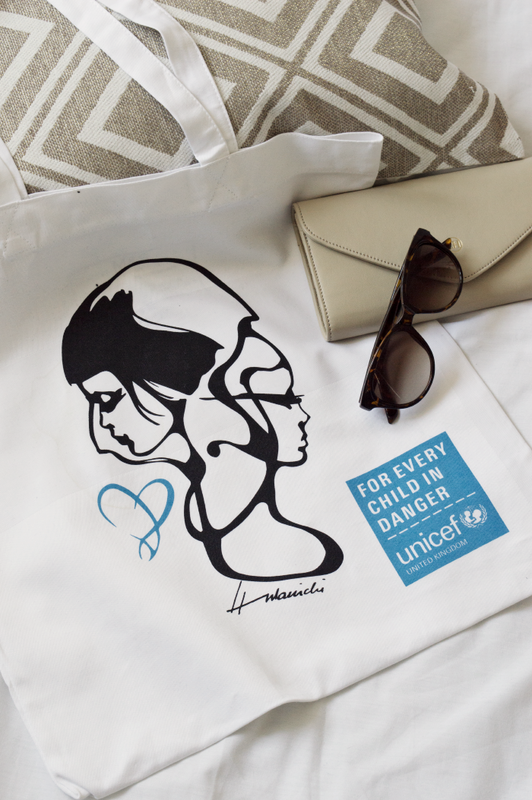 To coincide with the plastic bag charge, Marks and Sparks have collaborated with UNICEF and the legend that is Barbara Hulanicki to release limited edition tote bags made from recycled linen that are also made in Britain! 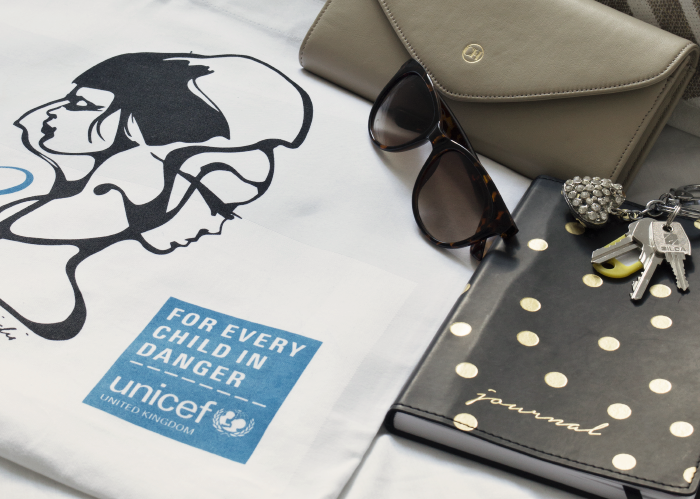 The bags are now available in stores and online and £1 raised from each bag will be going to UNICEF to help children in danger all across the world. 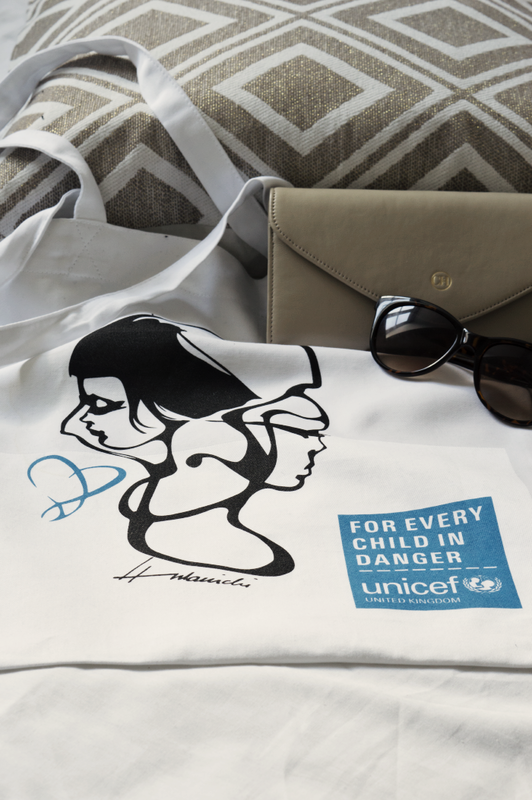 I'm so happy to be able to add this special tote to my ever growing collection of shopper bags - its fabulous design and origin is proof that you can do something good and still look good doing it! 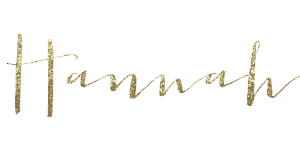 As always, I'd love to know your opinion on the debate - so please comment below, tweet me @dimplesdiaries or snapchat me @hannah-dimples your thoughts! I think when it comes to beauty and makeup, French women do it best. 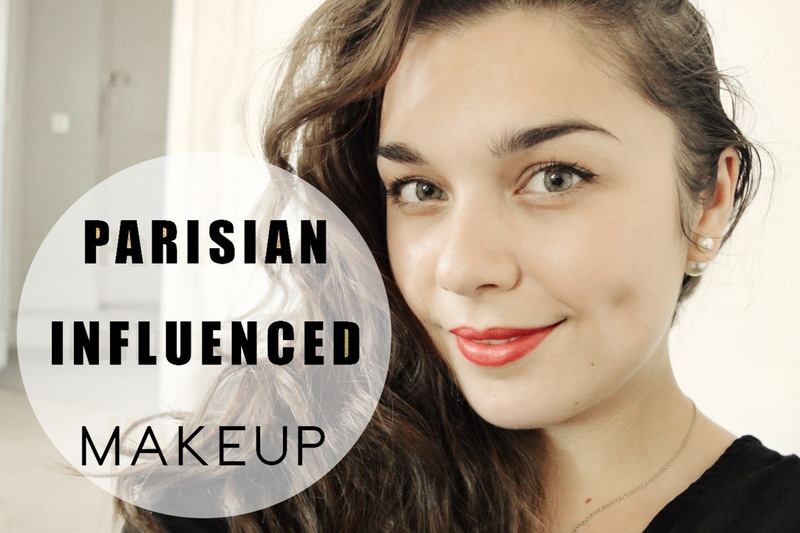 And as it's Paris fashion week I thought I'd dedicate a tutorial on a french-inspired makeup look I wear on a regular basis. It's packed with base products that will make your skin glow, an iconic cat eye liner and a bombshell red lippy to die for! 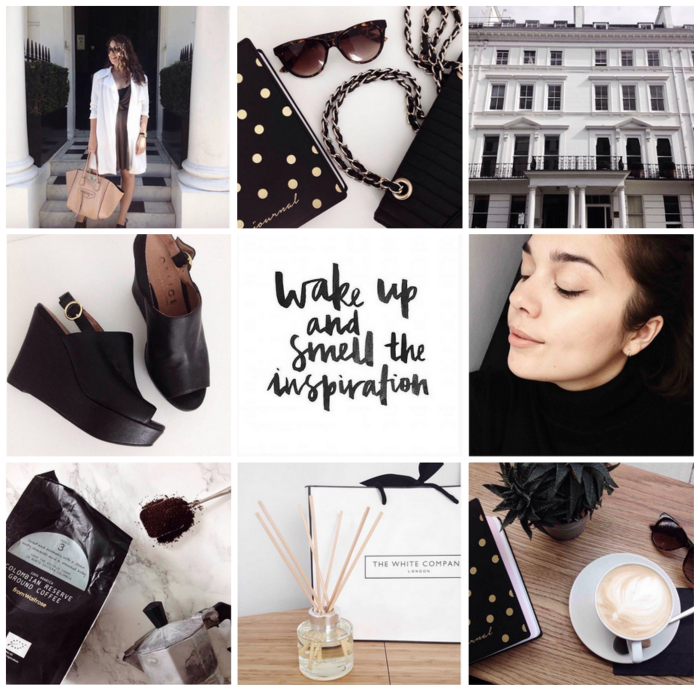 Leave your links below and click on the image above to see more of my Instagram! Stay tuned for the Milan and Paris round ups over the next coming weeks!